In the blustery winter of 1950, U.S. Major General Oliver Smith and his elite 1st Marine Division were surprise attacked by some 3000 Chinese troops as the Americans attempted to take control of the mountainous eastern coast of North Korea. Suffering 1,500 casualties and over 4,000 wounded, Smith withdrew his force and delivered his now-famous quote: “Gentlemen, we are not retreating. We are merely attacking in another direction.” Smith then reassessed strategy, regrouped, and, with fresh supplies and ammunition, drove the Chinese off in one of the most heroic struggles in military history. There’s a powerful lesson investors in today’s volatile market can take away from Major General Smith. Namely, that when the going gets tough and you feel backed into a corner, there is a way to come out on top. But, like Smith, you need to continually reassess your approach and have the conviction to go in a new direction. Some might say the U.S. now finds itself backed into in a foxhole when it comes to meeting its energy needs. Although we have the highest rates of energy consumption in the world, it’s no big news that our traditional sources of oil are either tapping out or have become “No Trespassing” zones, leaving us dependent on foreign sources for 70% of the oil needed to keep the lights on. It behooves us, then, to better understand the nature of the foreign sources. To do so, we are going to use an approach usually found in a military context, dividing the sources into Allies vs. Axis --- an appropriate model given the current war being waged for global resources. To better understand the reliability of America’s oil imports it’s helpful to see who America’s faithful oil-suppliers are – and who they aren’t. The chart shows that 54% of U.S. crude imports come from countries we consider Allies willing to work with the United States (shown in black and grey). Some 31% of imports come from Axis countries (shown in shades of red,) that have demonstrated hostility to America. Another 15% are from Saudi Arabia, a Wildcard we believe could go either way. It’s unsettling to note that almost half of U.S. imports come from countries that are either unfriendly or have potential to be. First, let’s take a look at the good half. Although these oil exporters have been willing enough to work with America, they face their own internal challenges. For example, the U.S. has powerful competition for both Canada and Mexico’s oil; and it’s from these countries’ inhabitants themselves. Canada already consumes 90% of the crude it produces, while Mexico consumes a growing 60% of its production. Further, both face challenges with their reserves. The only abundant reserves Canada has are the oil sands -- expensive and difficult to extract. And Mexico, with its reserves dropping quickly, is likely to become a net importer of crude in about six years. Read that last sentence again, because right now Mexico is the third largest source of oil to the U.S… just after Saudi Arabia. Shifting farther away from home, the stability of exports from Nigeria and Iraq is challenged by internal unrest. Nigeria is destabilized by ethnic battles, ongoing supply scares, kidnappings, sabotage, clashes with militants and election unrest. In addition, resource competitors, including China and India, are both making inroads in that country. Meanwhile, Iraq’s reliability is largely dependent on a long-term U.S. presence in the area, a presence that is in doubt. And these are the good guys! Now, let’s touch on the almost-50% of imports that come from considerably less reliable sources. The stability of U.S. relationships with both Venezuela and Russia is questionable. Venezuela, under Hugo Chavez, has already reduced exports to the U.S. And Russia has shown dubious motives. Its recent tap-twisting with natural gas exports to the Europeans reinforces that it sees energy as a tool for gaining geopolitical power. 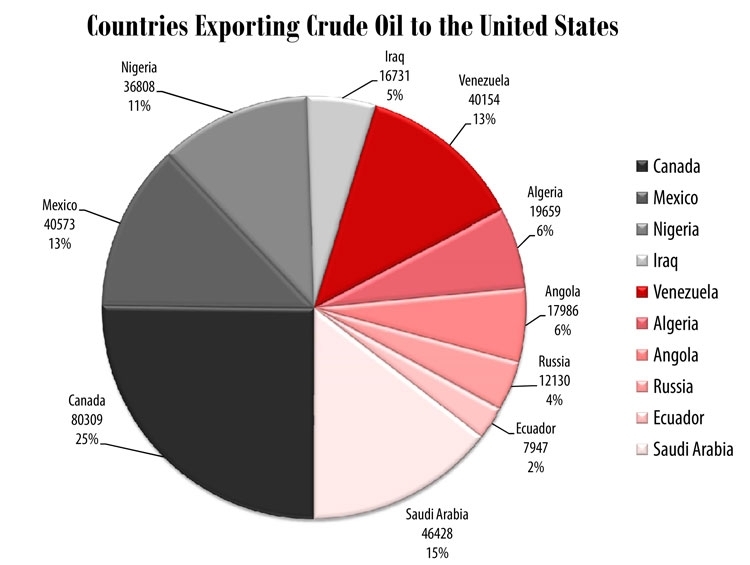 Angola, Algeria and Ecuador are very willing to sell oil to the US right now, because they need the money. But, they have also ramped up exports to other countries. Over time, they may pick and choose to whom they sell their increasingly precious commodity. Saudi Arabia – source of an impressive 15% of exports to the U.S. -- is holding its dance card close to the chest. It either could supply the US reliably over the next few decades, or, through its OPEC power, increase the price of crude even more. Despite the relatively stable relationship between the U.S. and the Saud family, rising regional tensions, increased Islamic militarism and ongoing Israeli-Palestinian tensions could threaten exports. And, the U.S. presence in Iraq has implications for the stability of Saudi Arabia’s supplies, too. Should the U.S. pull out of Iraq, any implied chance of U.S. troops supporting Saudi Arabia, should push come to shove, disappears. (How likely would the U.S. be to send troops back to Vietnam?) This could leave the Saud’s looking elsewhere for security guarantees – guarantees that would invariably be purchased with a realignment of oil sales to suit the new benefactors. With such vulnerability in our supplies, America’s quest for new oil is vital. The single most important conflict of this war will be replacing declining reserves. But for war profiteers -- or investors -- profiting big starts with betting on the right army. The unexpected victors of one early American military conflict come to mind as an example of the right type of regiment to back. Remember that famous 1775 battle of Lexington and Concord, the “shot heard round the world” that kicked off the Revolution and culminated in our freedom to pursue our way of life? It wasn’t the British Redcoats, trained to fight the old-fashioned way, lined up and advancing in unison, who won that one. They ended up scrambling for cover, tripping over their coattails as they hightailed it all the way back to Boston Harbor. It was the Minutemen, the rebellious, nimble scrabblers, who knew the terrain, left business-as-usual behind and, sniper-like, came out on top. So it will be in the search for new oil today. This time, the major oil companies are wearing the red furry helmets and buttoned up uniforms and are ending up the casualties of war. That’s because the old world army, including players like ExxonMobil, Royal Dutch Shell, BP, Chevron, ConocoPhillips, must cost effectively replace their flagging oil reserves and maintain production or face a quick retreat… in their share prices. And these days, finding large new pools of oil that can be cost-effectively developed is no easy task. Plus, they’re facing stiff competition from China, Russia and others who are cashed up with plenty of fresh ammo – namely trillions of U.S. dollars thanks to the historic trade deficits of the last decade or so. These new, nationally-sponsored competitors, who aren’t constrained by prohibitions against handing over suitcases of cash to win concessions, are quickly signing long-term off-take agreements where price is hardly discussed in the negotiations. In the war for new oil, the business-as-usual army has little chance of advancing in the right direction. So, if not “big oil”, where should an energy investor look to deploy their capital? We’ll place our bets on the Minutemen, or the small, more agile oil explorers targeting under-explored areas in the U.S., Canada, and more remote areas of the globe. Rather than being caught up in layers of bureaucracy, and hindered by the negative associations of big oil, these smaller companies can act swiftly and have grass-roots connections with local politicians to help push their projects forward. Plus, they can operate in areas that are less populated by environmental protest groups that can challenge progress. Most importantly, when a small company makes a large discovery it can have a huge impact on its share price… where even a large discovery, by today’s standards, will barely move the dial on a multinational giant. Investing in one of these companies early is one of the best ways to not only insulate yourself against the personal inconvenience of steadily increasing energy prices, but also to make you one of the few real winners in the war now being waged. The global energy squeeze threatens to empty your gas tank – but it can more than fill up your wallet. You just have to know where to invest. We do the research heavy lifting, so you don’t have to. Subscribe to Casey Energy Opportunity for just $9.95 per month, with a risk-free money back guarantee.